Frontier Marshal is a 1939 western film directed by Allan Dwan and starring Randolph Scott as Wyatt Earp. The movie is the second film produced by Sol M. Wurtzel based on Stuart N. Lake's biography of Earp, Wyatt Earp: Frontier Marshal (later found to be largely fictionalized). 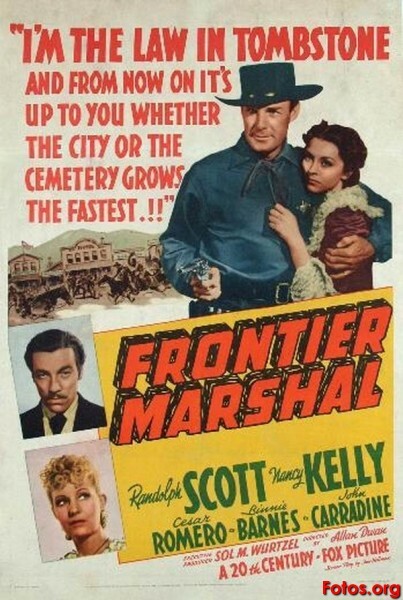 An earlier version was Wurtzel's Frontier Marshal, filmed in 1934. A later version of the story was filmed by John Ford in 1946, My Darling Clementine, which included whole scenes reshot from the 1939 film. Frontier Marshal co-stars Nancy Kelly, Cesar Romero as "Doc Halliday" (the name was changed for the film from the original "Holliday"), John Carradine, and Lon Chaney, Jr.. Ward Bond appears as the town marshal; Bond was also in the 1934 version, and later appears as Morgan Earp in Ford's film. Eddie Foy, Jr. plays the large supporting role of his father, entertainer Eddie Foy, in this as well as three other feature films, and looked almost exactly like his famous father.